Intensified protests throughout the region in recent months. Across the Western Balkans, citizens have been increasingly taking to the streets in recent months in waves of at times disparate protests. With prospects of European integration having cooled, endemic corruption and high unemployment continuing to be the norm, and few signs of social or economic progress, there appears to be a growing sense of frustration at the region’s “business as usual” politics. From weekly anti-government protests in both Serbia and Montenegro to students occupying their faculties in Albania and exasperation with judicial institutions in Kosovo and Bosnia and Herzegovina, there has been little let up in citizens voting with their feet since the closing months of 2018. In some instances the messages appear to be clear: gender equality, media freedoms or transparent justice. But in many others they are fluid, an ever-changing and sometimes uneasy coalition of diffuse frustrations and interests. Vladimir Unkovski-Korica, a lecturer of Central and East European Studies at the University of Glasgow in the UK, says that the protests in the region are part of a broader trend and it relates to the global failure of the neoliberal transformation that started during the Cold War and intensified after it. According to Unkovski-Korica, one should be careful not to characterize the majority of these protests as being motivated by a single issue, pointing out that in many places one can see liberal, far right and radical left forces at the same protests. He also highlights that various nationalisms are evident in many of the protests, emphasizing that it’s hard to speak of nationalisms all being the same: Some are the cry of an oppressed people, and others the roar of the oppressor. “Outside powers have played on such divisions for decades and centuries, and the position of oppressor and oppressed sometimes switches,” he says. Unkovski-Korica adds that, nonetheless, this protest wave suggests that something is changing, one way or another. “Fundamentally, though, I wonder if there is not a hint of a demand for democracy in all these movements, a demand for self-determination, a desire to control one’s own condition,” he says, adding that this need not lead to division, but may also implicitly raise the possibility of unity in diversity, as long as this unity involves respect and solidarity. K2.0 looks at some of the protests that have been taking place in the region in recent months and the issues that are bringing citizens out onto the streets. On December 8, 2018, citizens in Belgrade started to protest against President Aleksandar Vučić’s government. The initial trigger came in late November when Borko Stefanović, head of opposition party Levica Srbije and former high level official in another opposition party, the Democratic Party, was physically attacked in the city of Krusevac. After a separate protest organized in Krusevac by opposition parties, the following week thousands of citizens marched in the center of the Serbian capital, expressing accusations against the president and his party regarding their authoritarian governance, threats to civil society and attempts to silence the voice of citizens, as well as against physical attacks against exponents of opposition parties. President Vučić’s response was to mock the initial protests, saying that “even if there were 5 million protesters,” he would not change course, while he has also suggested that if the protesters would prefer they could call snap elections to confirm who has the support of the people; despite a wave of mass protests after his convincing early 2017 election victory that saw him become president, opinion polls repeatedly show that Vučić maintains significant support. Unperturbed, protesters gathered again the following week, this time using the slogan and hashtag #1od5miliona (#1In5Million), after Vučić’s own words. From then on, every Saturday there have been protests in the streets of Belgrade as well as in dozens of other towns and cities throughout the country, demanding an end to repressive state control, including over the media. Protesters have been taking to the streets of Belgrade and other Serbian cities and towns since early December. Photo: Marion Dautry / K2.0. On March 16, anti-government protesters marched in the streets of Belgrade for a 15th consecutive Saturday. Sofija Todorovic is a Belgrade-based activist who was initially taking part in the protests. She believes that protest as a democratic tool is always beneficial for a country and society and strongly believes that it is good when people who are unsatisfied use democratic means and tools to send a message to the government or state institutions. She says that the international media and NGO media such as BIRN are covering the protests and that’s the only place that one can actually find precise and accurate information about what is happening. The protesters’ frustration at the lack of media coverage of the protests by the state broadcaster, Radio Television of Serbia (RTS), is also reflected in statements by independent international monitoring bodies. On March 18, protesters marched into RTS, accusing it of being in the service of President Vučić, and demanded space to voice their stance. They were ultimately forcibly removed by riot police. Interior Minister Nebojša Stefanović accused the protesters of trying to forcibly impose their political agendas and trying to repeat, as Minister Stefanović said, the “Macedonian scenario,” referring to the entry of protesters into Macedonia’s parliament in April 2017. At the front of Saturday’s occupation of RTS was far right movement Dveri and its leader Bosko Obradovic, an indication of how the nature of the protests have changed and seemingly become increasingly diffuse in their aims and demands over time as some groups have attempted to use the momentum to try to push forward their own agendas. Criticism of what some nationalists see as Vučić’s soft stance toward Kosovo have also been visible in the placards in recent weeks. The day after the RTS occupation, President Vučić gave a press conference, in which he claimed that it was nationalist and fascist elements that were leading the protests against him, while also suggesting that they were being urged by Kosovo’s prime minister, Ramush Haradinaj. While he was holding the press conference, thousands of protesters surrounded the presidency building to prevent Vučić from leaving his office; Vučić responded by posting a picture on his official Twitter account of himself playing chess with his Interior Minister. Todorovic says she has become “very skeptical” about the political direction of the protests and is no longer taking part, particularly after incidents where she felt like the principles of free speech and tolerance were no longer being represented by protest organizers. “People are going to be betrayed again, there is a lot of anger and grief — no one should use this for the promotion of political ideas that only take us backward,” she says. Montenegro has also seen its own wave of protests against its leaders since the turn of the year. Starting in early February, hundreds of protesters have regularly marched on the streets of the capital, Podgorica, rallying against widespread corruption and alleged links between top state officials and organized crime. Citizens, supported by most opposition parties, have been demanding the resignation of President Milo Đukanović — who has been in power almost continuously for three decades — the government and key figures in the judicial system. The trigger for the protests was the koverta (envelope) affair, which includes the public revelation of footage that provides visible evidence of the corruption of high level officials, including those close to Djukanovic. Knežević has since claimed that he has been secretly helping to bankroll Đukanović’s ruling Democratic Party of Socialists (DPS) for decades. 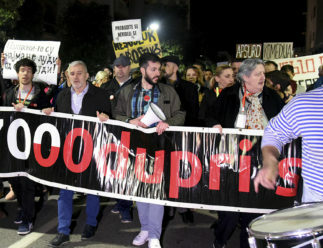 Thousands of protesters have taken to the streets of Podgorica each week since early February calling for key political and institutional resignations following the publication of footage showing high level corruption. Photo: Boris Pejovic / K2.0. Mekić adds that this is only one in a series of affairs that the current government is implicated in, and explains that their protests include moving to different state institutions, including the state broadcaster, which he says are simply serving DPS rather than the state as a whole. “During these walks, we have submitted demands for resignations to the president, the prime minister, the supreme [state prosecutor] and special state prosecutor [for organized crime], and the director of the Agency for the Prevention of Corruption, as well as the director and the whole council of Radio Television of Montenegro,” says Mekić, adding that they hope that they will soon reach a critical mass that will force the institutions to fulfill these initial demands. Protest organizers have recently asked opposition parties, which support the protests but have not played a formal role in their organization, to form a “unity government” in order to pave the way to new elections in Montenegro. Many opposition parties have also been boycotting Montenegro’s Assembly since 2016’s elections, which they claim were full of irregularities, although the largest opposition party, the Democratic Front, agreed to return last year. Albania is also currently experiencing anti-government protests, although here they are directly being led by opposition parties. 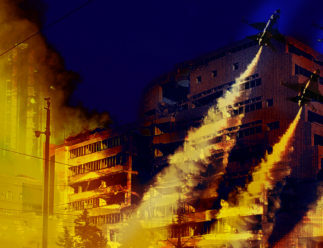 The first such protest was on February 16, when the Democratic Party and other opposition parties led a protest against the government, which ended in violent scenes as protesters attacked the offices of Prime Minister Edi Rama and there were clashes between protesters throwing stones and police using tear gas. Following the protest, many opposition deputies resigned their mandates in an attempt to bring down the government, although new deputies from the same opposition parties have defied party orders and have since been sworn in. The opposition protests follow hot on the heels of student-led protests, which began in December 2018. The resignations were widely condemned as “undemocratic” by foreign embassies, who also criticized the violence in the protests. A month later, on March 16, opposition parties again organized a protest demanding Edi Rama’s resignation and early elections. Again, the protests turned out to be violent, as protesters tried to storm the Parliament. 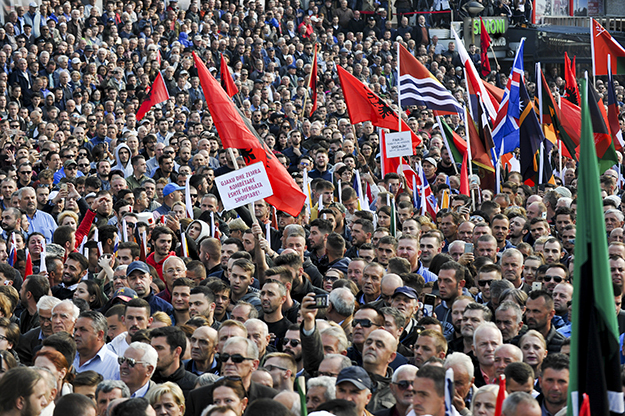 Democratic Party leader, and former government minister and mayor of Tirana, Lulzim Basha, has announced that the opposition protests will continue, and mainly opposition activists have continued their opposition on the streets in recent days. 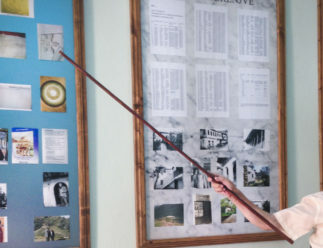 The root of the student protests stems back to 2015, when Albania passed a new Law on Higher Education in an attempt to reform the sector; it gave public universities greater autonomy in terms of finances, academic autonomy, organization and staff selection. At the same time, universities began receiving less money from the state budget, under the reasoning that they had greater autonomy to raise their own funds. In December, the accumulated frustration among Albanian students in relation to this law came to a head, particularly around the issue of exam retake fees, which had been introduced earlier in the year amongst minimal public discussion. 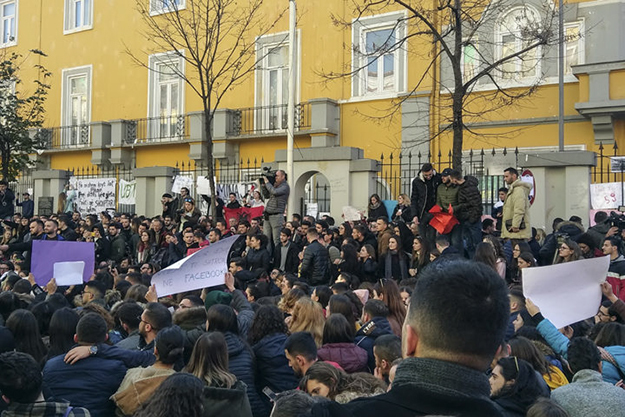 Protests began on December 5 with Faculty of Architecture students demanding the removal of the tariff for retaken exams and quickly spread to both Durrës and Elbasan. In the following days, many students from other faculties joined the protests and released a series of demands including the halving of all student fees, student representation in university decision making bodies and better dormitory conditions. Firstly in front of the Ministry of Education, Sports and Youth and then before the Prime Minister’s Office, thousands of students and supporters protested each day up until the end of year holidays, with their list of demands steadily growing. 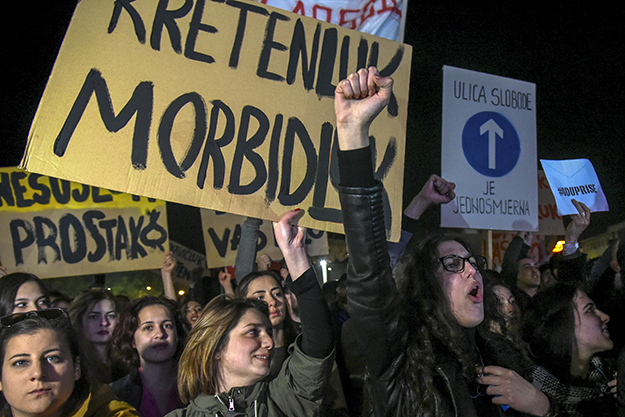 Students, frustrated with the state of higher education in Albania, took to the streets of Tirana in December in the country’s biggest citizen-led protests for years. Photo: Lorin Kadiu. After the holidays, students implemented another form of protest, occupying the Economic Faculty and Law Faculty from January 9. Despite an intervention from the Police, students had these two faculties under occupation for a month. Liri Kuçi, an activist of the For the University movement that emerged in 2015, says that after the protests in the streets students moved their protest to the faculties in order to strengthen their organization and to protect themselves from outside political exponents, alleging physical attacks as well as attempted infiltration from opposition activists posing as students. Overall, she says the intensive wave of protests in December was a symptom of the general dissatisfaction in the higher education system. Prime Minister Rama took over all communication with students and the public in relation to the protests, which were the biggest citizen-led protests in Albania in years. His approach toward the protests characteristically fluctuated from accusations that the protesters were being incited by the opposition and that some of the students were flunkers, to pledges to review the Law on Higher Education and to accept some of the students’ demands. On December 28, Rama also took the decision to dismiss a number of his ministers — including the minister of education — and to replace them with young technocratic substitutes. In recent weeks, the student protests came to an end and public attention shifted to the opposition protests. Protests in Kosovo have not been as persistent in recent months as they have across the border in Serbia, Montenegro or Albania, but there have still been significant manifestations, both in the form of ad hoc protests and more regular demonstrations. One subject that especially incited reactions toward the end of 2018 was the much discussed idea of exchanging territory with Serbia. Although he has never stated so explicitly, President Hashim Thaçi has been widely credited by local and international analysts with devising the idea, and has been its biggest public proponent since the rumor first started to do the rounds last summer. Civil society, the opposition, government coalition partners and even Thaçi’s former party emphatically declared themselves against this idea. With the exception of some leaders of the Academy of Sciences and Arts and a minor opposition party that is not represented in the Assembly, there was minimal domestic support for the idea. Kosovo opposition party Vetëvendosje led a mass protest in September against potential changes to the border with Serbia that are being pushed for by President Hashim Thaçi. Photo: Atdhe Mulla / K2.0. This did not stop opposition party Vetëvendosje from calling a protest on September 29, through which they made calls against the disintegration of Kosovo’s territory. Although the number of protesters was lower than in protests in 2015 and 2016 — when opposition parties united together to lead protests against the introduction of the Association of Serb-Majority Municipalities and a controversial agreement to demarcate the border with Montenegro — thousands turned up to voice their objections to changing the borders. 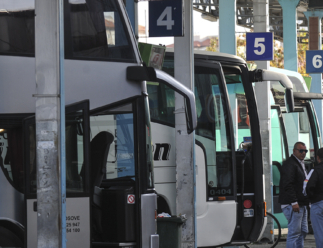 Six months later, the notion that this idea may be implemented in some form has not gone away, particularly as it is seen as a potentially viable option by the U.S. and some European Union countries. However, it remains unclear exactly what is being discussed by Thaçi and Vučić in the Brussels-based EU-facilitated negotiations, which are still ongoing. A number of Kosovo’s political parties have come together to create a negotiation team that is intended to negotiate together with the president in meetings with their Serbian counterparts, with the justification that this would serve to control the president and prevent him from making any decisions that they deem harmful to Kosovo. Earlier this month, the Kosovo Assembly approved the negotiation platform drawn up by the negotiation team, although the two biggest opposition parties — LDK and Vetëvendosje — have refused to support it or to join the team claiming that this team would legitimize Thaçi’s decisions. Away from protests led by political parties, Kosovo has also seen a growth of citizen-led protests in recent times. In August, hundreds of protesters took to the streets to demand the dismissal of the chief prosecutor following a scandal involving inflated lists of war veterans. Earlier that month, the prosecutor tasked with investigating criminal wrongdoing in the drawing up of lists of veterans — who are eligible for state financial assistance — had resigned and gone to the United States. Elez Blakaj said he had been forced to do so following threats received in the course of his investigatory work and also alleged that his work had been obstructed by Chief Prosecutor Aleksandër Lumezi. Blakaj stated that during his investigation, he had uncovered approximately 20,000 names that had been included in the lists without merit. The U.S. Embassy, the president and many members of civil society immediately expressed their support. But the prime minister, Ramush Haradinaj, labelled him an “impostor,” while Lumezi also issued his own scathing personal attack on his former colleague. In August, the #Protestoj citizens initiative once again led anti-corruption protests in Prishtina following the resignation of prosecutor Elez Blakaj, who alleged the chief prosecutor had obstructed him from completing his work. Photo: Atdhe Mulla / K2.0. What followed was a wave of citizen-led protests under the #Protestoj (#IProtest) banner, which had first been used for anti-corruption protests in 2016. In addition to demanding Lumezi’s resignation, protesters also called for the lists of veterans to be cleaned, since it is estimated that the number of fake veterans receiving social assistance is costing the public purse 38 million euros each year. Although the protests came to an end without achieving their demands, Gramos Buçinca from the Protestoj citizens’ initiative believes they still had some impact. “Through our pressure, a proper debate about the merited benefits for [those who fall within the various] war categories [eligible for social assistance] was supported,” he says, adding that in their protests, they had real veterans, deputies from different political parties and citizens from different classes and social backgrounds. Buçinca also believes that both these demonstrations and previous #Protestoj protests — which followed the publication of wiretapped conversations that revealed wide scale corruption and misuse of public office by officials at the heart of one of the governing parties, PDK — helped to put pressure on judicial institutions to pursue prosecutions. He adds that such civic initiatives are desperately needed for the development of Kosovo, especially as it goes through a “transition phase,” as they enable citizens to put pressure on the government. Another such initiative that has been increasingly active in recent times is the MARShojmë S’festojmë (MARCHing Not Celebrating) collective, which has been campaigning for gender equality and social justice for the past three years. The network of civil society organizations and individual activists first came together to organize the annual International Women’s Day protest on March 8, 2016, but has since expanded both in terms of size and the issues tackled. Adelina Berisha, advocacy and research coordinator on gender based violence at NGO Kosovo Women’s Network — one of the founders of the collective — says that more and more organizations have gotten involved over time. 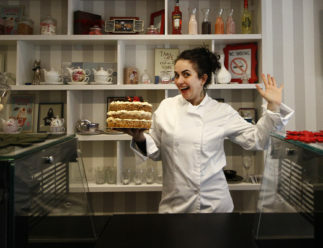 “We have a mailing list, where we keep each other updated, the reactions, protests we organize, non-formal activist groups, so we can have a better and bigger mobilization during our different reactions,” she says. 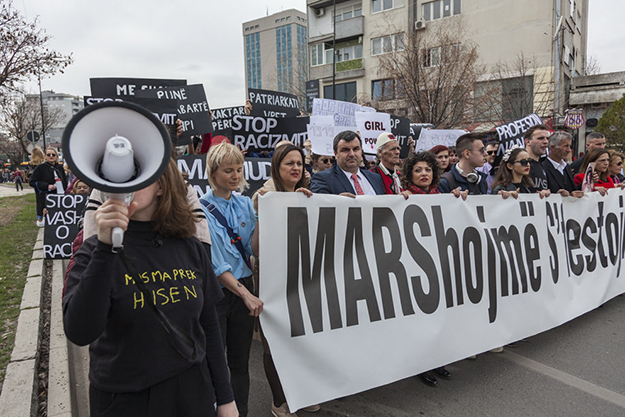 The MARShojmë S’festojmë collective has been leading the annual International Women’s Day march in Prishtina since 2016, and has also expanded to help organize other ad hoc protests. Photo: Majlinda Hoxha / K2.0. In February 2019, MARShojmë S’festojmë helped to mobilize citizens for two protests after a high profile case shocked Kosovar society. It was reported in the media that a girl from Drenas had been sexually abused from the age of 16 by her school professor. When she went to report the case to the police, one of the police officers also allegedly sexually abused her for two years; when she got pregnant, the policeman allegedly forced her to abort. On February 7, a protest was organized by Youth Initiative for Human Rights in front of police headquarters in Prishtina, while the following day a protest march was organized by the local Youth Council in Drenas itself. “We, as a collective, immediately gathered and decided to help the Youth Council in Drenas to organize the protest,” Berisha says. The strong public reaction to the case led to Kosovo’s Assembly holding an extraordinary session, while three implicated persons — the professor, the police and the doctor who allegedly carried out the illegal abortion — were arrested. A deep mistrust of institutions has also been at the center of protests in Bosnia and Herzegovina in recent months. For months, citizens have been taking to the streets of Banja Luka and Sarajevo demanding justice for two young men, whose deaths they believe came about in suspicious circumstances and have been covered up by authorities. In March 2018, 21-year-old David Dragičević was supposedly returning from a bar in the city of Banja Luka, in the entity of Republika Srpska (RS), when he disappeared. He was later found dead in the River Crkvena. According to the official course of events, David was involved in a fight on the night he disappeared and then went on to rob a house before finally jumping from a bridge into the shallow, sewage-filled river, where he drowned. 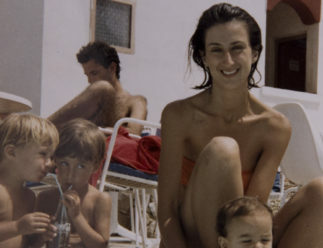 But the deceased’s family believe David was murdered and have accused the police of hiding the truth while seeking the help of citizens to shed light on their son’s case. During an extraordinary session of RS’s National Assembly, David’s father Davor named four high level officials who he believed were responsible for helping to cover up his son’s death, including RS’s interior minister and police director. 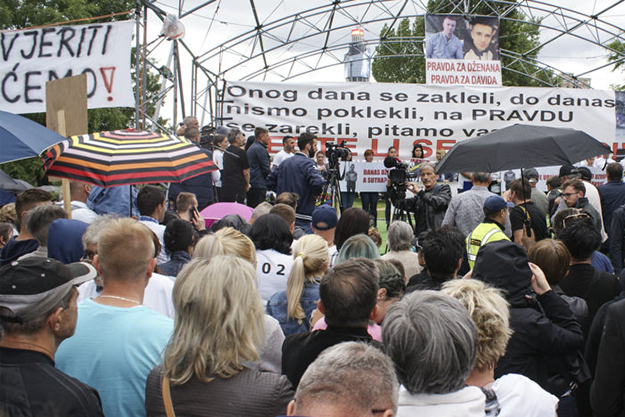 Protesters seeking justice and accountability for the suspicious deaths of two young men in Bosnia and Herzegovina have come together regardless of ethnic group or political affiliation. Photo: Lidia Kurasinska. 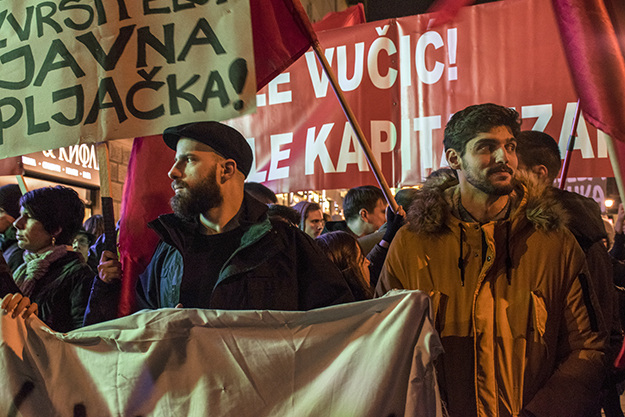 Banja Luka city center has seen daily protests — which grew dramatically in the second half of 2018 — largely coordinated by the Pravda za Davida (Justice for David) movement, which has more than 250,000 members of its Facebook group. David’s case has echoes of another case from two years previous — that of 22-year-old Dženan Memić. Dženan was brought to the hospital in Sarajevo severely injured on February 8, 2016. He passed away a week later. Although Bosnian police reported that he had been injured in a traffic accident — and two men were put on trial for causing the accident and fleeing the scene — Dženan’s family have denied this version of events. Muriz Memić, Dženan’s father, has always insisted that his son was murdered and that the crime was covered up by the prosecution and the police; he insists that the cantonal chief prosecutor personally informed him in March 2016 that his son had been murdered. In the past three years, Muriz Memić has organized dozens of protests in Sarajevo calling on the police to bring the perpetrators to justice. David and Dženan’s fathers fought on opposite sides during the Bosnian War but their attempts to seek justice for their sons has seen them and their supporters come together regardless of ethnic group or political affiliation. 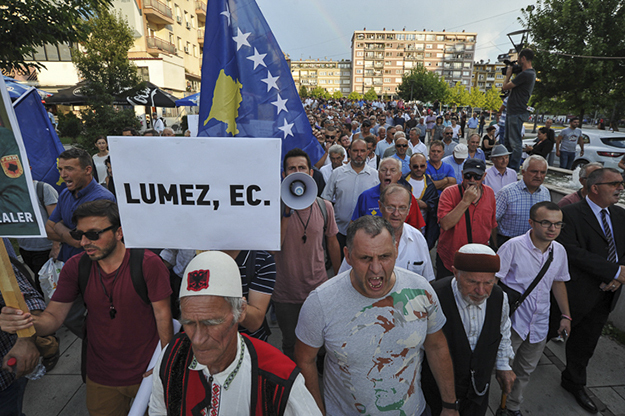 On May 15, 2018, in a show of inter-ethnic solidarity rare in modern-day Bosnia, approximately a thousand people came out to support the fathers’ quest for justice as the two men gave a joint press conference, while thousands of citizens subsequently got together for simultaneous protests in Banja Luka and Sarajevo. Davor Dragičević, his wife and a number of other members of Pravda za David have left the country, claiming they have been under significant police pressure and that they fear for their lives. In December, the situation escalated when Davor Dragičević was arrested following a reported scuffle between protesters and police; the EU office in Sarajevo responded by expressing its concern over the arrest and urging the police to show restraint. Milorad Dodik, who was prime minister of Republika Srpska at the time, stated that the protests were politically motivated; some opposition politicians have attempted to associate themselves with the protest movements. Since Davor Dragičević’s arrest, he, his wife and a number of other members of Pravda za David have left the country, claiming they have been under significant police pressure and that they fear for their lives. Some members of Pravda za Davida are still trying to gather each night in Banja Luka, but their numbers are much smaller than last year, amid claims that RS police are restricting freedom of assembly and have forbidden anyone to gather in what has been dubbed “David’s Square,” the place where he was last alive. Igor Štiks, a Sarajevo-born scholar, has said that the recent protests, as well as widespread protests that took place five years ago in Bosnia and Herzegovina, are focused on social justice, and for the first time have shown up the inequalities in the current system as well as highlighted the possibility of acting differently. “They have showed up all the rottenness around them,” he said in an interview for Oslobodjenje in February 2019. In many ways, Macedonia is in a different political moment to the rest of the region after its “Colourful Revolution” in 2016. Zoran Zaev’s Social Democratic Union of Macedonia (SDSM) came to power in early 2017 after a decade of rule by Nikola Gruevski and his VMRO-DPMNE party that was characterized by increasingly autocratic tendencies and the country falling off the path toward Euro-Atlantic integration. VMRO-DPMNE was eventually forced into opposition at the ballot box amidst persistent mass protests, largely centered around Zaev’s “bombs” — wiretapped recordings that revealed significant corruption within Gruevski’s government and invasive state secret service surveillance led by his cousin. For many, a new window was opened in the history of Macedonia’s political transition — an era of internal economic and political stabilization and a return to the path of Euro-Atlantic integration. But as a condition for admission into NATO and the EU, Macedonia was required to solve a political issue that had gone on for more than a quarter of a century: solving the “name dispute” with its neighbor to the south, Greece, which claimed that the name Macedonia implied irredentist tendencies due to its own region by the same name. After intense negotiations, on June 17, 2018, at the edge of Lake Prespa at the border between the two countries, an agreement was signed between Zaev and his Greek counterpart, Alexis Tspiras. Macedonia was to become known as Republic of North Macedonia. Hundreds of protesters from the For a Common Macedonia organization took to Skopje’s streets to oppose the name change, labeling it as an act of treason. Only three days later, Macedonia’s parliament ratified the agreement, but before it came into effect an advisory referendum was held on September 30. The opposition insisted that the Prespa Agreement was a national capitulation for Macedonia and did not encourage its supporters to participate, while the president actively urged citizens to boycott the plebiscite. Although 91 percent of voters ultimately voted in favor of the agreement, participation only reached 37 percent, not the 50 percent required by Macedonian law for referendums to be considered valid. However, Zaev’s government insisted on pushing forward with the name change regardless. In October, discussions began in parliament for amending the Constitution in relation to the Prespa Agreement, and on January 11 parliament approved the amendments, which came into effect on February 12 after Greece also ratified the deal. In the meantime, hundreds of protesters from the For a Common Macedonia organization took to Skopje’s streets to oppose the name change, labelling it as an act of treason by Prime Minister Zaev. The same organization had also protested in April 2017 against the election of an Albanian politician as head of the Macedonian parliament, as well as in early 2018 against the approval of a law that expanded the use of Albanian as an official language in Macedonia. Feature image: Marion Dautry / K2.0. ABOUT THE AUTHOR Fitim Salihu is a K2.0 staff journalist, covering mainly politics and governance. Fitim has a bachelor’s degree in political science from the University of Prishtina.